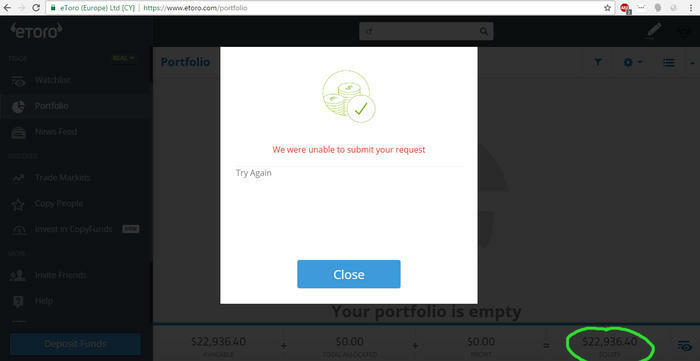 After using etoro trading platform for two years, on March 30th 2017, I realized by myself that my account was completely blocked, strange situation since I had not been given any notice. I couldnt open new positions, withdrawals were automatically rejected. Panic! I tried to get in touch with the company but it was in vain, I was ignored every time. At some point I thought their servers had been hacked. Many days later, on April 3rd 2017, I discovered 7494.89 USD had been silently wiped out from my balance. I got really worried. I attempted many times to reach the company’s customer support to get an explanation about what had happened since I did not have a single clue, but I was told nothing. 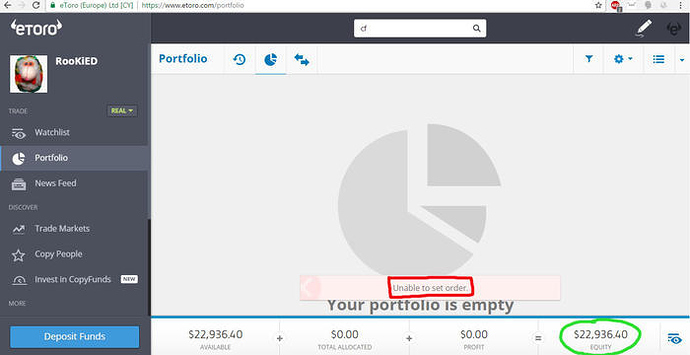 After being ignored by etoro for more than a week (absolutely unprofessional!) I received the first reply from the company on April 7th, in which they took responsibility for both actions, alleging they had suffered delays on their price quotes during the days 20 to 24th of March 2017, alleging that I had supposedly used a strategy based on those delays and that, enabled by their terms and conditions, they had blocked my account and had taken the total profits I had made during those dates. etoro only gave me the list of the trades that were apparently involved and refused to show me any other information. They further threatened to void all my transactions and terminate the relationship if this trading behavior continued. This is total fraud. I was never aware of any delays during dates 20 to 24th of March on their platform, and I certainly did not develop a strategy based on them. I can’t believe this company is actually licensed. Can’t get any more unfair than this. Hello guys , can someone help me ,pls! 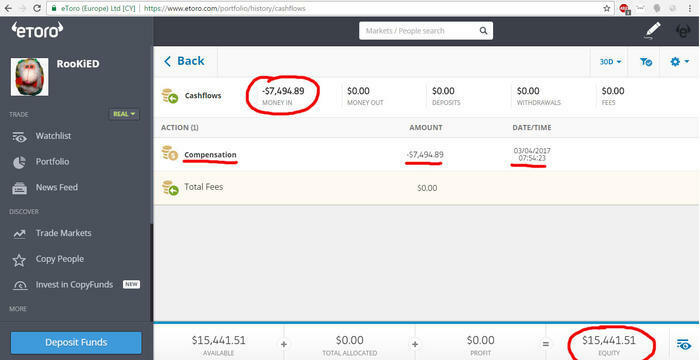 Etoro topic about 7500usd stolen is gone? Hi there and thanks for sharing this case. For sure it is a tricky/messy situation. As a customer, the information I can have about my trades, server latencies and everything related to it is absolutely LIMITED. What you are requesting from me… to prove my innocence!! it’s just not possible. Out of my reach. I think you got it wrong… backwards in effect. If a company were to throw such an accussation and implement actions based on it, the least they can do is show the information and demonstration of this behavior strategy or whatever with clear examples. And they have not done any of this. On the contrary, they’ve even warned me no to repeat it or they’ll terminate my account and void all transactions… and yet I have no idea what no to repeat or how to avoid it. You have to keep in mind that, if delays truly existed, it is the company at fault in the first place for not providing an accurate service. A clear indisputable explanation is the least they can offer. This was not a single trade, there were a lot of trades… during 5 days!! As I mentioned I do not know this broker and I don’t know what are their procedures in such cases. Thus you should ask for clarifications from their side. I mean how did they come to this conclusion. the least they can do is show the information and demonstration of this behavior strategy or whatever with clear examples. Absolutely agree with that! Anything other than that seems completely unprofessional and wrong. Read closely their client agreements and ask for detailed information. If they cannot provide you with a logical explanations with examples, log files etc. you may also consider some legal actions. I don’t know how it works but the case is related to a decent amount so it is worth doing some research. Good luck and please keep us updated if there are any changes. I thought Etoro is well regulated. What is stopping you from reaching out to the so-called regulators. When a broker is cheating, forums and review website is where most traders run to. What then is the benefit of trading with a regulated broker if we cannot get our money back when cheated by a broker. Etoro and the likes of whom boast about being regulated have a reputation of taking traders earned money whenever they like and we can’t do anything about it. What separates them from unregulated brokers then? Was it your profit or your initial deposit? BTW making 7K in several days is pretty good results and can be really made on latencies (considering you may have access straight to the exchange). BTC market is full of inefficiencies and price lags that’s why I wouldn’t recommend to trade on it with any FX broker. Go straight to exchange and make money there. Do you have a CySec or FCA account with them? Hey pip2hunt. Thanks for you support man. Ive been very very busy. I havent heard from the company at all. Ive contacted many authorities, some refused to participate for not having jurisdiction. CySEC and the Financial Ombudsman of Cyprus took the case and they are reviewing it. I sent them a full report. Im also planning on publishing on FPA forums where they have a chance to reply with a solid explanation or a democratic voting from the forum users will get etoro labeled as scammers. Before this incident, I had been a trader on etoro for 2 years, so nothing to do with my deposits. I appreciate you recognize my good performance, but it is unfortunate you quickly mix it with how possible it is to make it on latencies. Exchanges are also relatively illiquid and I guess you could also build an argument around this, myself moving the exchange and profiting on etoro. Think about it, the company could have used this claim to take my money too and nothing would be different. I have done none of the above, my trading was honest. In the past, I’ve used bitcoin exchanges. Some brought me problems, and I lost money (irregularities, delays, hacks, unprofessionalism). 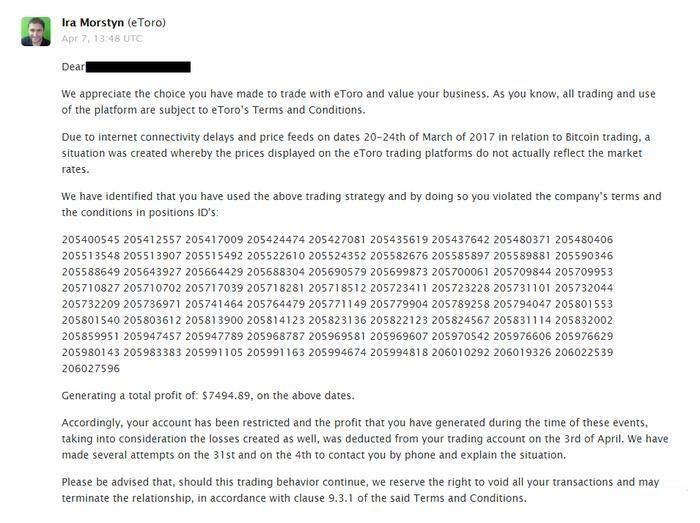 This is why I decided to give etoro a chance with bitcoin trading precisely because it is a regulated company and I thought it would actually give me another layer of protection, security and professionalism. Well this event has proven exactly the opposite, regulations have meant nothing, etoro took my money and made a poor claim with no real explanation. Sure, I will be trading bitcoin directly on exchanges from now on. My trust with these kind of companies is broken. I have learned from this. Well I have reached regulators and sent them a full report. I hope I get a proper investigation and resolution to my case. Had this company been well regulated, there wouldnt have been any incident, I am sure of it. Unfortunately, regulations come slowly, and requires many years of reviewing until they are applied and required. Technology and financial market advancements come with a different pace, much faster, and I have found through my research related to this incident that for example CFDs (assets I bought and sold on my trades) are not much regulated really although they have been used for 10 years already. MiFiD 2 (Markets in Financial Instruments Directive 2) will be applied in 2018 which should regulate the use of these contracts considerably in Europe as far as I understand. So you made these results by trading bitcoin? If yes, then very impressive. As for the case, even though if you have used latency arbitrage or any other market-abusing practice (which I do not claim you did, it’s just hypothetical), once they freeze your account, they are obliged to notify you immediately for their actions and explain why they did it. At least this is expected from a reputable broker with a good customer support. And not to leave you in the dark for almost a week and what is worse - to ignore your attempts to understand the situation. Rookied how much was your deposit and how much interest was made on it? As I said before, I traded on etoro many instruments for 2 years before this happened, I did not send an exclusive deposit. Ok Rookied but have you ever done withdrawals with them before?? Because i just signed up few days ago and i’m still doing some research before i do any deposits. The more pressing question should be “why did you pick Etoro in the first place”. These social ‘broker’ websites are a real red flag, in my view anyway. I don’t want all the bells and whistles which are attached to many brokers these days, rather though as a rule of thumb you’d have more reliability with brokers who are stripped back and simply let you speculate on market data. has this thread not opened your eyes already? Let me spell it out for you. etoro might just freeze your account, take your money and you’ll not hear from the company with a real explanation or response again unless you sue them. This is how they acted in this case. Stay away from this company, that is my advice. You are absolutely right, and I can see it now. But it’s not that easy to have this kind of forethought in the beginning. Had I been aware of how these bucket shops work, I would have tried to trade only in a real professional company like interactive brokers. To be honest I never used the feature of social trading of etoro. What attracts new people is how easy it is to start trading, the low capital requirement and the platform which is relatively friendly for noobs. The marketing they invest on is very effective. After a while you get used to it as with everything else. But in the end you learn the lesson. These cheap companies like etoro, do not act as a clearing house, a neutral party in your trading. Instead, they are the counterparty on most of your trades whereas what you buy is just a contract (CFD - contract for difference). In other words, the company makes money (aside from fees) when you lose, and loses when you profit. This generates conflicts of interest quite easily when for example there are technical problems in any of the markets you’ve traded, or if you simply steadily profited long enough then you may just become inconvenient for these companies. Trading in these places is just looking for trouble. It’s not sad when you see a new comer suffering because it’s often wrong selection and all that the reason. But, when this happens to someone who is trading for so long is just shocking and truly sad. This is where it should not just be about regulation but quality of broker that needs to be good. I am sorry but Etoro was never one to go with! What do you mean by brokers who are stripped back? Etoro has been around for some years now. But that does not make them reliable. By fact and proof, they are one of the most unreliable brokers in the market. It is even safer to trade with offshore brokers than trade with Etoro. They have made too much money and do not care about traders’ fund security anymore. EEA and/or may be unregulated. eToro will not be responsible in the event of losses caused by those third parties. Any news regarding the stolen 7.5k?